COOLOMG is founded in the year 2014, in the California, United States of America. Company is focusing on manufacturing of arms and knees sleeves, and also protective gears by selecting finest fabrics, using security providing technologies and strictly following to ISO production process. By manufacturing high-quality products, COOLOMG has accumulated a good reputation all over the world, but it is still improving itself by offering only most comfortable and stylish professional sports products. This knee pad is intended for knee protection during sports activities such as basketball trainings and games to prevent different knees injuries, for example, bruises, bumps and abrasions, which are quite widespread in sports. However, this pad can be used in other sports and physical activities too, but remember, that this pad may be too thin for sports such as volleyball or football, where sportsmen often are falling down. This basketball knee pad has an anti-slip line, which ensures pads sticking to skin and constant stability, so its wearer can feel safe and comfortable, not worrying about pads slipping down. Its padding is made of hundreds of hexagon type, separately placed pads, therefore it conforms to joints much better and gives its wearer more flexibility and comfort. This COOLOMG basketball knee pad comes in black, white, dark blue, red, purple, orange, yellow, fluorescent green, light blue and pink colors, so everyone can choose the one, which it likes the most. 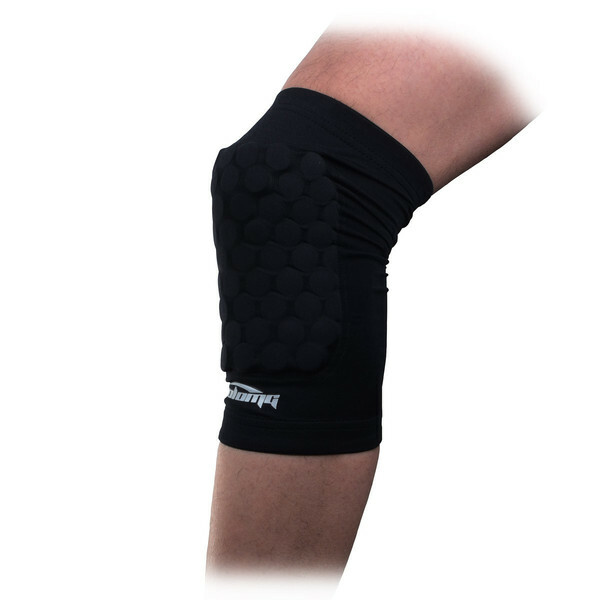 It has thick seams, therefore this knee pad is durable and safe. As I mentioned before, this knee pad has a padding, which is made of small, hexagon type pads, and anti-slip line inside of it. It has a COOLOMG logo on bottom. To find out, what is your knee pads size, you have to measure your knees circumference. When it is done, follow the table further. This COOLOMG Pad for basketball is sleeve type pad, which is intended for knee protection during sports activities such as basketball trainings and games to prevent knees injuries. This pad is made of polyester and it comes in black, white, dark blue, red, purple, orange, yellow, fluorescent green, light blue and pink colors. There are five possible sizes of this pad – XS, S, M, L, XL – and its weight depends on its size. Considering that it has five different sizes, it can be suitable for children, youngsters and adults. This basketball knee pad has features such as anti-slip line, which prevents its slipping down, and padding made of hexagon type pads, which ensures better fitting. This prduct is machine washable and usually is sold as single, so if you need to protect both of your knees, you have to buy two of them.